I usually use some sort of white fish when making fish tacos, but decided to mix it up by searing some tuna. Fontina is a great melting cheese and I think it works really well here, but use whatever cheese you like to go with these tacos. Add sour cream, cilantro, chile powder, cumin and salt to a food processor and pulse until dressing is smooth. Toss cabbage with dressing (you may not need all the dressing) and set aside. Peel mango and avocado, cut in half and slice thinly. Sprinkle tuna steak(s) with salt and pepper. Heat pan on high and add canola oil. When the pan is smoking hot, add tuna and sear for about two minutes on each side. If the tuna steaks are very thin, reduce time. Remove tuna from pan and slice into strips. 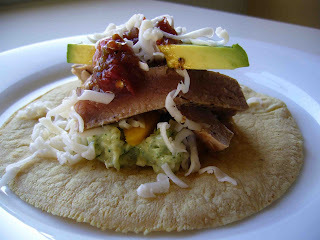 Set out tuna strips with shredded cheese, mango, avocado, cabbage, salsa and tortillas and let people build their own tacos. Enjoy! Fantastic! I've been looking for a fish taco recipe I can really sink my teeth into...gotta give this one a try! Usually when I sear tuna I go the asian flavor route- it'll be nice to go south of the border.